Ordinary music fans may never have heard of John Meyer, but chances are, he has helped them to enjoy music at one point or another. Speakers from Berkeley, California-based Meyer Sound, the company he co-founded with his wife in 1979, have powered tours from artists like Bob Dylan, Metallica, Herbie Hancock and Usher. They’re used for Cirque de Soleil shows, have helped address crowds of 800,000, power churches, concert venues, casinos and movie theaters around the world. 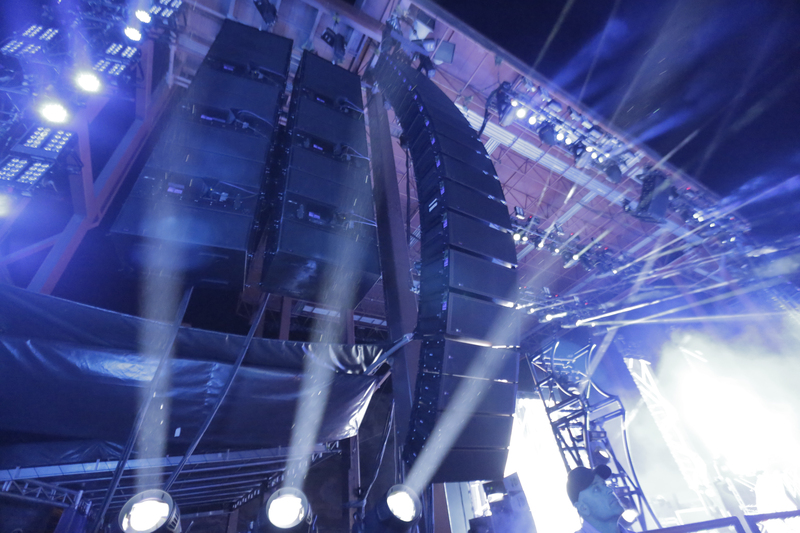 A Meyer Sound system on tour with Bassnectar. Image: Meyer Sound. In professional audio engineering circles, Meyer is regarded as a pioneer, because he was one of the first to take the idea of linearity — meaning that the audio coming out of the speaker should sound exactly like the input, just more amplified — from studio monitors to concert venues and stadiums. He also was an early proponent of self-powered speakers, which are basically speakers that already contain the amplifier and all related electronics. Most recently, Meyer has made waves with acoustic systems that can shape the sound of a room through a combination of microphones and loudspeakers, helping churches to adapt to a wide variety of performances and keeping the noise level in high-end restaurants at bay. In other words, he knows a thing or two about audio. I recently got invited to visit the Meyer Sound production facility in Berkeley, where the company locally produces each and every part of their speakers in a slow process that ensures quality control from start to finish, and chatted a bit with Meyer about how technology has been changing his industry. Overall, Meyer was very optimistic about the impact of new technologies. But when I asked him how this shapes the way consumers get to experience sound, he struck a cautious note. “I’m worried that my generation has gotten too lost in the technology,” he told me. That’s because Meyer sees a move towards two extremes. One the one side is highly compressed sound, which Meyer called elevator music, only to add: “There is nothing wrong with elevator music. It just shouldn’t be the diet that everyone has.” One the other hand is a trend to ever higher bit rates that resembles the megapixel wars in the digital camera space, with companies trying to push digital music towards a resolution of 192 kHz, often combined with proprietary formats. 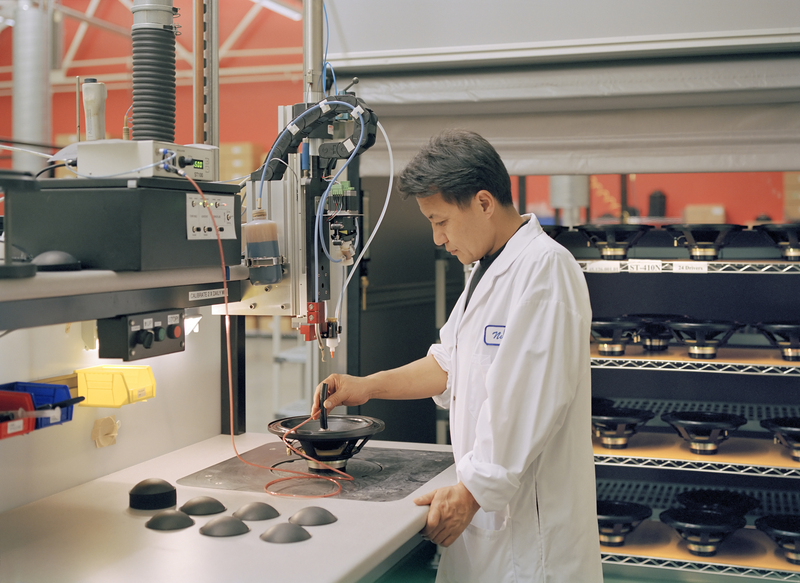 Meyer Sound loudspeaker driver manufacturing in Berkeley, California. Image: Meyer Sound. Meyer said that it simply “doesn’t make sense” to go higher than 96 kHz / 24 bit, which already is an order of magnitude better than standard CD audio. He also lamented that companies are trying to sell upsampled music — songs that were recorded with lower bitrates and resolutions, but are then altered to offer the appearance of a higher-resolution. “Using 24/96 is not the answer unless it is recorded in 24/96,” Meyer quipped, adding that people are getting wiser about snake oil claims, thanks largely to internet forums. “You can’t win those fights anymore, you can’t bamboozle the public,” he said. Music companies and high-definition music vendors should instead embrace the open FLAC audio format, he suggested. “It’s well worked out, it’s geeky,” he said, adding that by his estimates, around 250,000 people are already downloading FLAC music files from the internet. He called on people in his industry to educate consumers about the value of something like FLAC. Instead, many would waste their time chasing new technologies. “I’m saying we should stop,” Meyer said. There are really 2 discussions here. One is about the means of production (in the studio, is it better to record at 44.1 or 96k, etc.) and the means of distribution (mp3 vs CD vs FLAC vs vinyl). I believe that what Mr Meyer was talking about was companies on the distribution side coming up with, and marketing, proprietary encoding formats that favor their distribution model but don’t necessarily work in favor of audio quality. This is one of those topics that always seems to degenerate in the same old arguments about double blind tests and CD vs vinyl. It should really be added to the the politics and religion list about topics to be avoided at the dinner table. I did a rather thorough investigation of this matter last month when I was participating in a heated discussion on the matter in a LinkedIn / Pro Sound News forum. Here are the facts. For comparisons, I downloaded Producer’s Cut by Emmylou Harris from HD Tracks as a 24/96 FLAC file. I chose this because of the quality of the original analog masters, and because I had ready comparisons on both AAC and MP3 — and vinyl. On my mid-speed connection, download time for the album was essentially real time: about 45 minutes. So the bit rate differential is close to 10-1. Subjectively, the added transparency and detail were clearly apparent to me and to three other listeners: two college students and an studio engineer. I like to listen to FM radio but hate the quality. I would even be happy if FM radio was even CD quality. omg, i felt like i just went and hung out at the NAMM show for about 10 minutes! I usually get FLAC and then change them over to Apple Lossless so they play well in iTunes and on my iPhone. My take is that vinyl sounds best, so as long as I’m Lossless or near, I should be OK in the car or on the iPhone. I’m an avid MP3 hater. I use Spotify a lot, which is 320, and it’s ok through my sound-cancelling cans, but sounds like crap on the home system or car. I’m seriously eyeing these PONO players that Neil Young’s company made. The dual outputs for headphones and car/system are really intriguing. Heh, these audiophiles are a real hoot! The interviewer and interviewee are confusing sample rate & bit depth with file formats. FLAC has nothing to do with whether music is 44.1 kHz or 192 kHz. FLAC can contain any PCM sample rate. Suggesting people should avoid snake oil and stick to FLAC makes absolutely zero sense. Upsampled snake oil is often sold as FLAC files. 1. sample rate and bit depth – the article is arguing that 24/96 is good enough. 2. Compression format – the article is arguing for FLAC, because it is an open source format. Why FLAC? Does a DAC take FLAC? No so why use it? I say use linear PCM (WAV, WAVb, AIFF). That way the computer app does nothing but output the file as is. It takes a ton of processing to convert FLAC/ALAC to PCM. Why waste the time and generate noise??? I do agree with the 24/96 comment. 32/384??? Why the chips cannot even process the stuff fast enough. Actually 96 kHz / 24 bit is almost twice as large, not twice as good. There has yet to be a study controlled for all other variables than sample rate and sample range which shows any statistically significant ability for humans to discern improvement above 44.1 kHz / 16 bit. To date, all such studies have produced a null result and have further shown that golden ears are mythical and in fact do not exist. Audio swims in a sea of snake oil. This says nothing about compressed formats and a study to find where they become statistically equivalent is very difficult to design because of the large number of parameters involved. If you can’t hear the difference between 96KHz 24bit and 41.1Khz 16bit then you’re hearing is almost gone. He said it has never been proven to make a difference in double blind tests (i.e., tests that actually prove something). He didn’t say there aren’t any people (like you) who claim that there is a big difference, but who are just fooling themselves, or others (heard of the placebo effect? Do yourself a favor and read the studies before making such a comment, please). There are many such people, which was the point of this article. I might be missing something here, but the article suggests that John Meyer likes to get his music for free? Does that mean he steals his music from the internet without paying the artist? Actually 96 kHz / 24bit is barely twice as good as CD audio. An order of magnitude (10x) better would be 441 kHz / 160bit. Words mean things. And in double blind listening tests nobody can tell the difference between 16 and 24 bit. The point is moot. 24 bit lenght word can represent a value 256 (8 bits extra) times more precisely than 16 bits one. Words mean things. Math means things too, in this case you probably should recognize the math in the sentence. Yeah the industry should have adopted FLAC a long time ago but they are not very smart when it comes to audio. Pretty much everybody loves mp3 with CBR encoding for marketing reasons most likely. Then they do 320kbps and they call it high quality. mp3 is fine for some things but they could at least go VBR and be more efficient not waste BW and storage. For at least some music , mp3 is really poor and ,it’s not like Google and Amazon and Apple got many other options to improve their offerings besides going higher quality. I wish even Youtube had options for audio quality, we have that for video,why not audio? FLAC just isn’t viable for most consumers/companies as it requires such a vast amount of bandwidth and storage. Adapting your hardware and networks to work with files 10x the size for an improvement that only a small percentage of people can perceive just isn’t worth it. Uncompressed CD quality is 1411kbps, FLAC usually around 60% of that, i.e., around 850kbps, so the factor between 320kbps MP3 and CD quality FLAC is something like 2.7, not 10. Are you sure you didn’t add an extra zero? 500-800kbps sounds a lot more reasonable. Ever watch a Netflix movie on your TV in HD? That uses about 5300kbps of bandwidth. Unless you live in sub-Saharan Africa, bandwidth is probably the least of your worries when it comes to high quality audio. That’s valid up to a point. I guess it’s true today but this discussion should be looking at the environment 3-5 years in the future when high (or, at least, sufficient) bandwidth is available to most users on most devices. And, in most cases, that’ll likely mean mobile/wireless. 5 years ago, the uptake of smartphone with usable mobile broadband was in question but, based on past experience, it was reasonable to assume that the bandwidth would get there. Likewise, at a point in time, you’d have doubted that there’d ever be sufficiently pervasive broadband to make a Netflix a viable business but, by betting that the bandwidth would be there when it was needed, Netflix is the leader it is. Storage costs are insignificant now and bandwidth has now caught up in metropolitan areas. What was your argument again? We’re talking digital music retailers here. If you have a 20M+ track catalog, storage cost is NOT insignificant. We’re talking petabytes here.